Isabella's white cell counts are high enough that she will be discharged from the hospital and going home today! Her platelets count is still low so she will get "topped off" before going home. Platelets are usually the last of the blood cells to recover from chemotherapy. This comes just in time for us to be able to enjoy the summer-like weather that we will have in CT where it is expected to be in the 70s and 80s all weekend! Below are a couple pictures I've taken over the last week. They were taken with a cell phone, so they are a little grainy. If you zoom into this picture of Isabella, you'll see that her hair is actually starting to grow back. 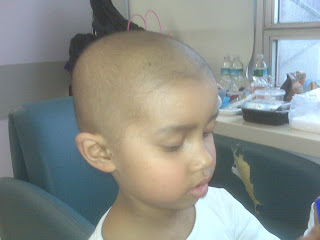 It'll probably fall out again during the next chemo cycle, but we're curious to see if her hair grows back differently. Remember way back when and Isabella wouldn't smile for any pictures? Here she is with Daddy with a nice big smile! I took this one myself, so it's a little blurry, but if you zoom in, you will also see that Isabella's two lower teeth that fell out are starting to grow back in. And finally, isn't technology great? This picture shows Isabella in a video chat with Annalise. Even though Annalise and Nathaniel can't be here at the hospital, they can both still see her over the Internet through our web cameras. The kids have fun with the special effects that they apply to the picture and you can see Annalise put herself into a heart. The results from the MRI show that although the tumor has shown no signs of progression, it has also not shrunk. This is really disappointing considering how well Isabella has been acting and responding to the treatments. If anything positive can be taken out of this it's that the tumor is stable and not growing rapidly, but the fact that the tumor is not responding to the chemotherapy is not good. 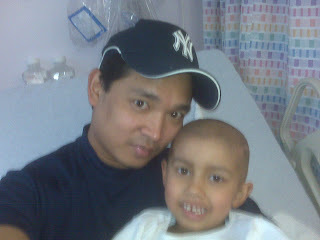 So for now, the plan is to continue with the last cycle of intense chemotherapy in two or three weeks. 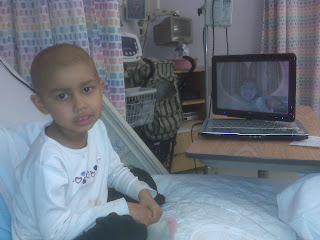 This will then be followed by the stem cell transplant from stem cells that we collected from her beforehand. Following the stem cell recovery, we will then proceed with radiation. In the short term, Isabella may be able to go home on Wednesday or Thursday. Her white count has started to come up, so as soon as they are at an appropriate level, we will be able to go home. Thanks to everyone who has taken time out to keep up with Isabella's progress. It's still nice to know that we are not going through this alone and that people all over the world are with us.